I believe I have discovered Leeds best kept foodie secret - The Food Academy, a restaurant ran by Leeds City College studetns. I got invited for a complimentary four course meal to show off the talents of the students. I had never heard of The Food Academy so in all honesty I wasn't really sure what to expect but I'm never one to turn down a foodie opportunity. Well here's the spoiler alert - the food was absolutely amazing! We got greeted with some Pimms cocktails and then sat down for our meal. Whilst we waited for the starters we were presented with some home baked sun dried tomato bread rolls, which the boy said was absolutely delicious. The staff were lovely though and presented me with some gluten free bread. 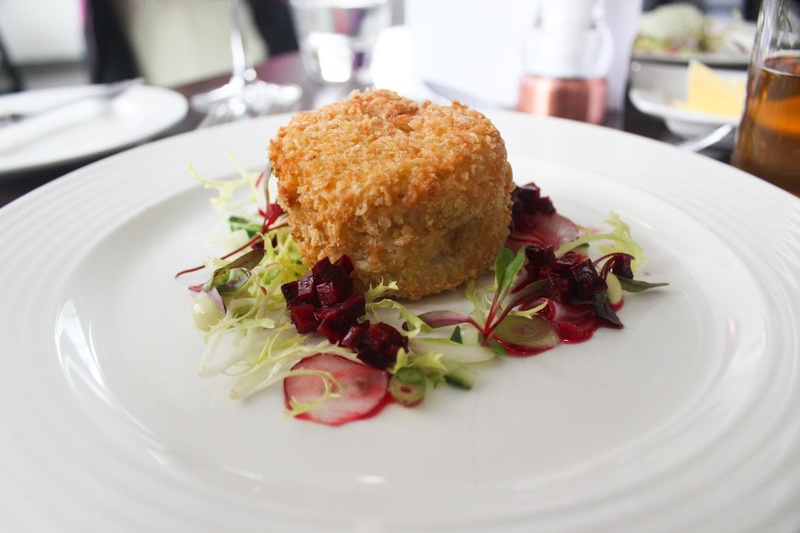 For our starters we had Veal and Goats Cheese Nugget which was served up with pickled beetroot, cucumber, spring onion and radish. The restaurant catered for my gluten intolerance by serving up the dish without the breadcrumbs for me. It was so so good! 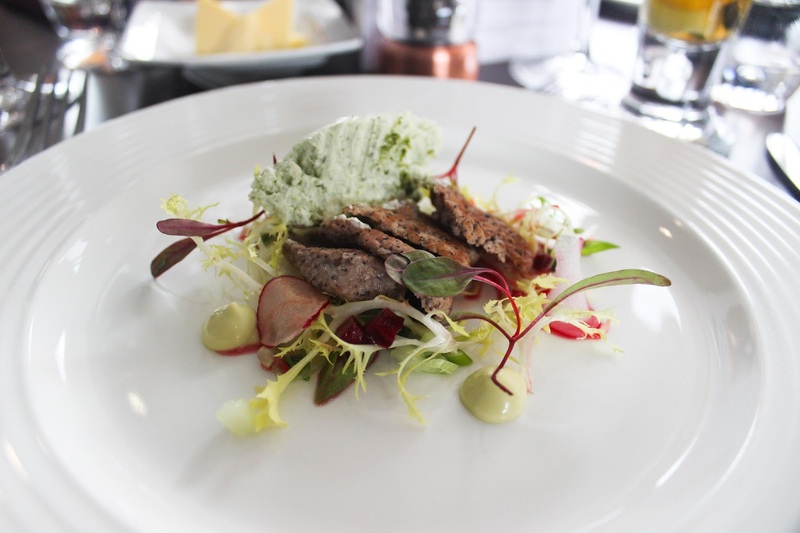 There was such a gorgeous combination of flavours I would order this dish again and again in fact I would go as far as saying that it was one of my favourite starters I've ever had. 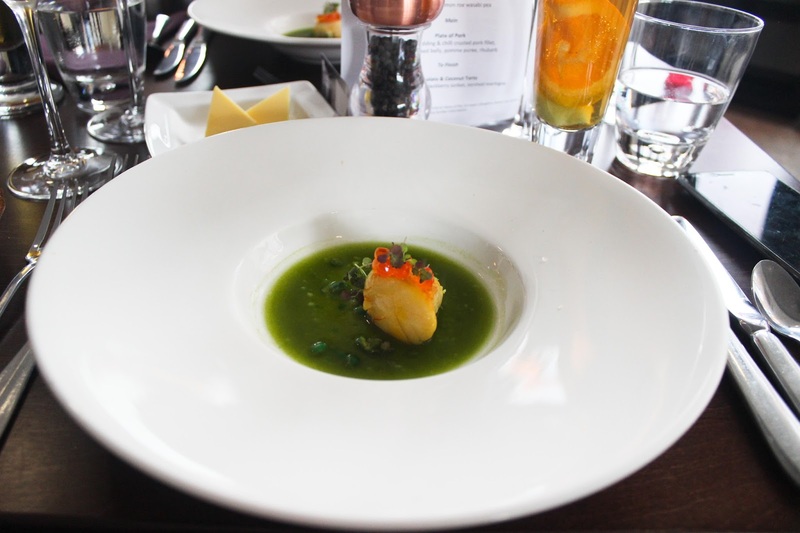 For the intermediate course we had a Saffron Infused Scallop served in herb soup, salmon roe wasabi pea. The presentation was beautiful but I'd never tried scallop previously and I have to say I wasn't a big fan, the texture freaked me out a little. The boy however absolutely loved it and finished mine off for me. 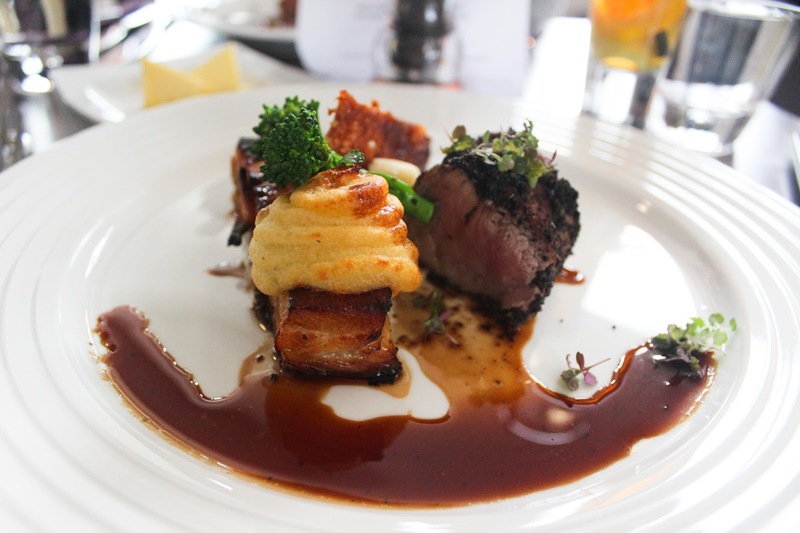 The main was a Plate of Pork which was a black and chilli crusted pork fillet, slow braised belly, pomme puree and crackling. I'm usually not really a massive fan of pork so when I saw the menu I pre emptied that I wasn't going to really enjoy it but I couldn't have been more wrong! The pork belly was cooked so well it wall falling apart at the touch of the knife. It was a very lean cut of pork belly and the meat practically melted in my mouth. 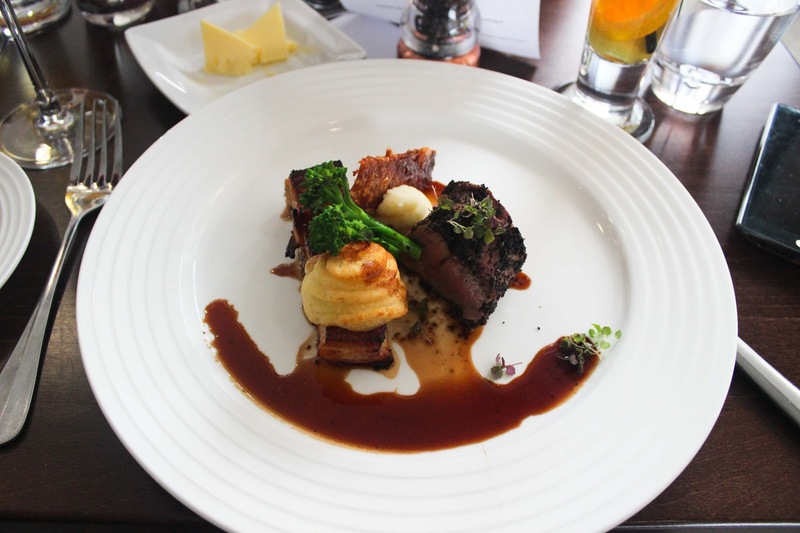 The pork fillet was full of flavour and again cooked to perfection. I can honestly say that it was one of my favourite pork dishes I have ever had. The mash that came with it was creamy and delicious I just wished that there was a little more of it. 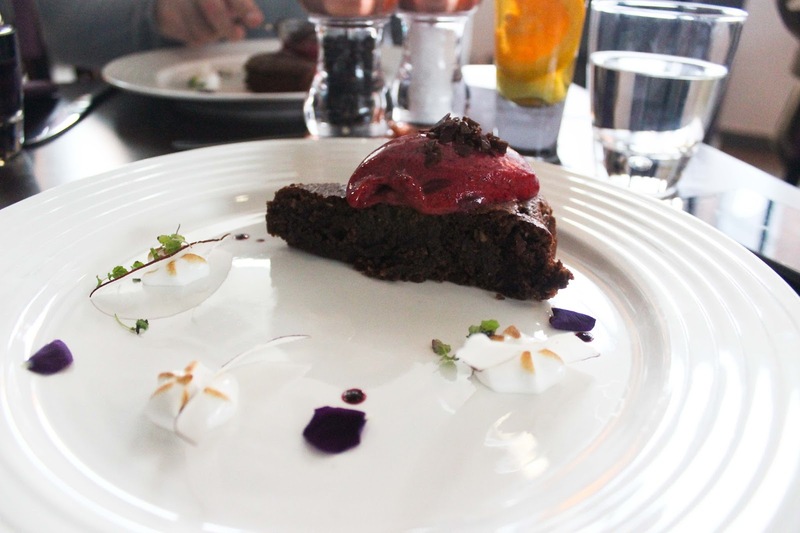 The dessert was a Chocolate and Coconut Torte served with blackberry sorbet and torched meringue. This torte was naturally gluten free and had the nicest texture. I will have to find out what flour it was made from but my guess is that it was almond flour (I'll update this once I find out!). I was already full from the other three courses but I completely polished of my dessert. It was one of the best tasting gluten free cakes I have ever had and I'm not even exaggerating. I really can't believe just how good the food was at The Food Academy, they have some amazingly talented student chefs who will go very far. The restaurant will be opening up again from the end of September and they also have a deli which sells locally sourced meat that is butchered on the campus. As soon as the restaurant opens up again we will be getting ourselves booked in!